READY TO LAUNCH A CAMPUS? discover helpful resources like promotional templates, module materials and report forms. The College of Prayer International is more of a movement than a program; more of an organism than an organization. We are fueled by a compelling vision: To reach a lost world through a revived church. In order to accomplish this, we mentor, train and equip leaders, which begins with the Servant Leadership Team (SLT) of your developing campus. 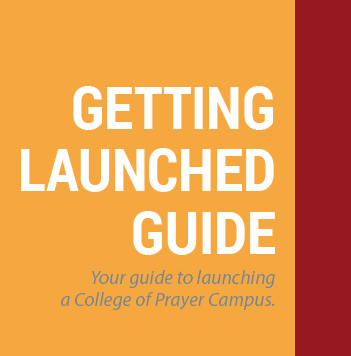 This Getting Launched Guide and website is designed to provide the SLT with practical resources to help launch a healthy campus of the College of Prayer in your area. If at any time you have questions, your Regional Director stands ready to assist and mentor you along the way. The samples of promotional and module materials should be used as a guide to help create the pieces you need for your upcoming module. For a more detailed overview of the College of Prayer International vision, objectives, distinctives, core values and specific roles and duties of an SLT, please reference the Manual of the College of Prayer International. 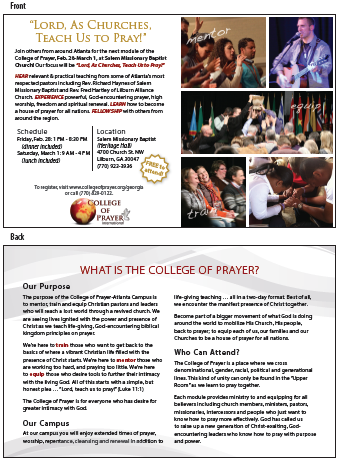 Many campuses find it helpful to print bulletin inserts/flyers to distribute to churches who participate in the College of Prayer. These churches can then make them available for their members to help promote your upcoming module. Postcards are another way to promote an upcoming module or as "Save the Date" flyers. 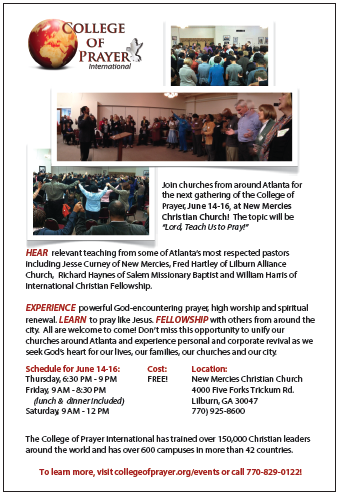 These postcards provide more detailed information about what the College of Prayer is and an invitation to be part of your local campus. Our International Office can send out promotional emails to your campus list upon request. This is a great way to stay in touch with the attendees at your campus. All emails are mobile friendly and will link directly to your registration page. The content is already created. 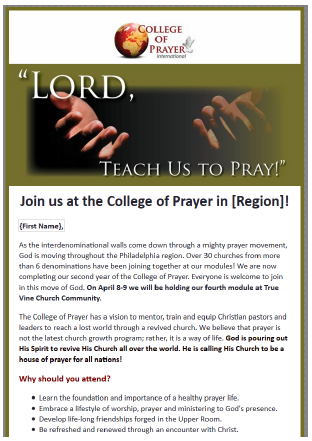 Simply email contact@collegeofprayer.org to let us know you would like this option. Our International Office makes available a 8 page brochure called "What is the College of Prayer International?" This brochure is a great resource to leave behind with pastors and church leaders who you network with to get them interested and involved with your campus. These brochures are available in English and Spanish. Please use our contact form to let us know if your campus needs this brochure and be sure to provide a mailing address and the quantity needed. Our two primary logos are our main College of Prayer International logo and our Escuela de Oración logo for our Hispanic Campuses. The downloadable files are high resolution PNG files, which should allow you to put them on any background. When resizing our logo, please resize proportionally (drag the corners of the image while hold down the SHIFT key). In addition to the curriculum, it is helpful to provide your participants with a general agenda of what will take place during the module. Please provide every participant with a name tag they can wear during the module. This will help foster a friendly environment. At the end of every module it is important to provide attendees with the opportunity to provide feedback and testimonies. This will help your campus serve people well and provide you with victories to share with our International Office. Every campus must submit a yearly financial and accreditation report form. This protects the integrity of our campuses and brings all of us under Godly authority and responsibility. Please download the forms below (Microsoft Word format), fill them out and send them to your Regional Director by December 1st each year. In addition, please use the Module Attendee Report Form (Microsoft Excel format) to submit your attendee list after each module to our International Office. 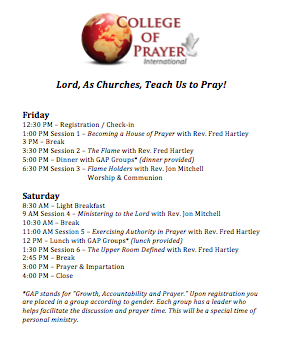 You can email this list to contact@collegeofprayer.org. ﻿NEED HELP? LET US KNOW.